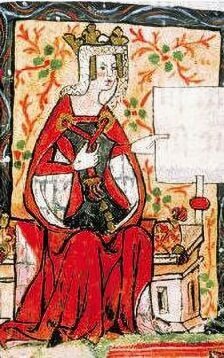 Matilda, or Maud as she is sometimes referred to, was the daughter of King Henry I and Matilda of Scotland, she was born around 7 February 1102 at the Royal Palace of Sutton Courtenay in Oxfordshire. Her grandparents were William the Conqueror and his wife Matilda of Flanders and King Malcolm III of Scotland and Saint Margaret. She had one sibling, a brother, William, known as the Atheling, for his descent from the old Saxon Royal House through St. Margaret of Wessex. 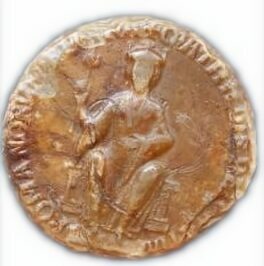 In April 1110, the eight year old Matilda was betrothed to and later married Henry, King of the Romans, and on 25 July she was crowned Queen of the Romans at Mainz. Henry V was crowned Holy Roman Emperor in 1117 at Worms. Henry died of cancer on on 23 May 1125 after which the 23 year old Matilda returned to her father in England. Her brother William had been drowned when the White Ship sank off the coast of Normandy, leaving Matilda as Henry I's only surviving legitimate child. Initially the king hoped to father another son. Matilda's mother, Matilda of Scotland, had died in 1118. Henry was remarried to the beautiful Adeliza of Louvain, but when she failed to conceive, Matilda was now her father's only hope for the continuation of his dynasty and he accordingly named her as his heir. He gathered together his barons at Westminster and in January of 1127 they swore an oath before the king to recognise Matilda as their future ruler. 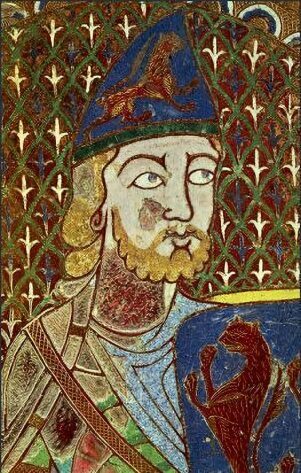 Henry I decided to marry his daughter to Geoffrey Plantagenet, the son of Fulk, Count of Anjou to secure the southern borders of Normandy. The haughty Matilda was insulted by the proposed marriage to the son of a mere count and one eleven years her junior and refused, at which her father retorted by locking her in her room until she agreed to comply. The couple, however, did not care for each other, their's was a union of convenience. Henry I chose Geoffrey to sire his grandchildren because his lands were strategically placed on the Norman frontiers and he required the support of Geoffrey's father, his erstwhile enemy, Fulk of Anjou. He accordingly forced his highly reluctant daughter to marry the fifteen year old Geoffrey. The pair disliked each other from the outset of their union and neither was of a nature to pretend otherwise and so the scene was set for an extremely stormy marriage. Soon after the marriage, Matilda left Geoffrey and returned to Normandy, they were, however, finally prevailed upon by the formidable Henry I to do their duty and produce an heir to England. They had three sons, Henry, the favourite of his adoring mother, was born in March 1133 at Le Mans. Henry I was delighted by the news and the proudly travelled to see his new grandson at Rouen. A second son, Geoffrey, was born at Rouen in 1134, his was was an extremely difficult birth leaving Matilda close to death. Following Geoffrey's birth, the relationship of Matilda and her father steadily deteriorated. In 1135, Henry again crossed to Normandy to see his two grandsons, Henry and his younger brother, Geoffrey, in whom the ageing king took great delight, dandling the young Henry on his knee. During his visit, he quarreled violently with Matilda and her husband. Henry was now an ageing lion, these quarrels with his daughter affected him badly and he died in Normandy on 1st December, 1135 at St. Denis le Fermont, from food poisoning, due to over indulging of his favourite dish of lampreys, which his doctors had forbidden him. Matilda's cousin Stephen of Blois, (the son of Henry I's younger sister Adela) who was in Boulogne at the time, set sail for England and claimed the throne as the nephew of the late king with the aid of his brother, Henry of Blois, Bishop of Winchester, who suggested that Henry I, alienated by his daughter, had changed his mind about his successor on his deathbed. Doubting that a woman could rule, most of the barons acquiesced in favour of a male ruler and Stephen was crowned King of England at Westminster Abbey on 26 December, 1135. Matilda was incensed at this treachery, but being pregnant at the time of her father's death, could do little. She gave birth to her third son William on 22 July 1136. Geoffrey mounted an invasion of Normandy in early 1136 and, after a temporary truce was agreed, invaded for a second time later that year. Stephen sailed for Normandy in 1137, but due to desertions in his army was forced to give up his campaign and a truce was reached. Matilda's illegitimate half-brother, Robert Earl of Gloucester, led a rebellion against Stephen, and declared his support for Matilda, Geoffrey of Anjou then took advantage of the situation by invading Normandy once again. Her maternal uncle David I, King of Scots also invaded the north of England, declaring his support for his niece. David's army was defeated by an English force led by William, Count of Aumale at the Battle of the Standard, fought on 22 August 1138 on Cowton Moor near Northallerton in Yorkshire. Matilda and Robert of Gloucester launched an invasion of England in September, 1139, she was received at Arundel Castle the home of her step-mother, Adeliza of Louvain, who was now married to William d'Aubigny, Earl of Arundel. Gloucester marched to Wallingford and Bristol, to raise support for the revolt. King Stephen besieged his cousin Matilda at Arundel Castle but finally agreed to a truce, Matilda and her household were released and escorted to the south-west of England, where they met up with Robert of Gloucester. There followed a long period during which the country was rent apart by civil war. The Anglo-Saxon Chronicle recalls the 19-year reign of King Stephen as an era “when Christ and his saints were asleep”. Stephen attacked Wallingford Castle, which was held for Matilda by Brian Fitz Count, but found it stoutly defended. He then continued into Wiltshire to attack Trowbridge. Miles of Gloucester, Earl of Hereford, launched an attack on Stephen's rearguard forces at Wallingford and threatening an advance on London. Stephen was therefore forced to return to London to protect his capital. A peace conference at Bath was arranged by Henry of Blois but this collapsed after Henry insisted that he and the clergy should set the terms of any peace deal, which Stephen's representatives would not accept. The powerful Ranulf of Chester, fell into a disagreement with King Stephen in 1141 and Stephen besieged his castle in Lincoln. Robert of Gloucester and his ally Ranulf advanced to Stephen's position, resulting in the Battle of Lincoln which was fought on 2 February 1141 where King Stephen was captured by Earl Robert and imprisoned at Bristol Castle. The clergy gathered at Winchester and declared Matilda the "Lady of England and Normandy". She travelled to London to arrange her coronation, but Matilda, who was by all accounts proud and haughty, alienated the citizens of London. She was sitting down to dinner in Westminster when a mob of angry Londoners attacked and was forced to flee the city. Robert and Matilda besieged the renegade Bishop Henry of Winchester, brother of King Stephen, at Winchester, but were forced into making a hasty retreat. The fickle wheel of fortune turned once more when Robert of Gloucester was captured by Stephen's Queen, Matilda of Boulogne, the maternal cousin of the Empress Matilda, at the Rout of Winchester. An exchange of prisoners was finally agreed upon, with no side gaining the upper hand. Matilda herself was very nearly captured while being besieged by Stephen at Oxford, but made a daring escape across the frozen river camouflaged in a white cloak. Meanwhile, Geoffrey of Anjou invaded Normandy again and took all the Duchy south of the River Seine and east of the Risle. Robert of Gloucester besieged Stephen in 1143 at Wilton Castle resulting in the Battle of Wilton, after which Stephen managed to escape. Matilda's young son, Henry Plantagenet was summoned to England in the hope that his presence would breathe new life into his mother's cause. Finally, Matilda reluctantly returned to Normandy in 1148. The struggle with Stephen for the crown of England was taken up by her son, Henry, known at the time as Henry Fitz Empress. On a second expedition into England, by the young Henry of Normandy in 1153, a compromise was reached in the Treaty of Wallingford bringing an end to the long Civil War. By its terms, Stephen was to retain the crown for the remainder of his lifetime, whereupon it would revert to Henry and his heirs. Stephen's son, Eustace, who was now disinherited, reacted in fury he went Cambridge to plan a further campaign, where he died the following month. King Stephen died in 1154, of an apoplexy, aged fifty-one and was succeeded by Henry II, the first of the great Plantagenet dynasty. Matilda lived on in Normandy and remained involved in governing the Duchy, she died on 10 September 1167 at the age of 65 , and was buried under the high altar at the abbey of Bec-Hellouin. The epitaph on her tomb reads 'Here lies, Henry's daughter, mother, wife, great in all three, her son the glory of her life'. The tomb was damaged during a fire in 1263 but was restored in 1282. Her remains were lost following Napoleon's destruction of the Church of Bec-Hellouin but were rediscovered and reburied at Rouen Cathedral.